Two members of the team at The Hub are in mourning for the loss of their elderly dogs this week. 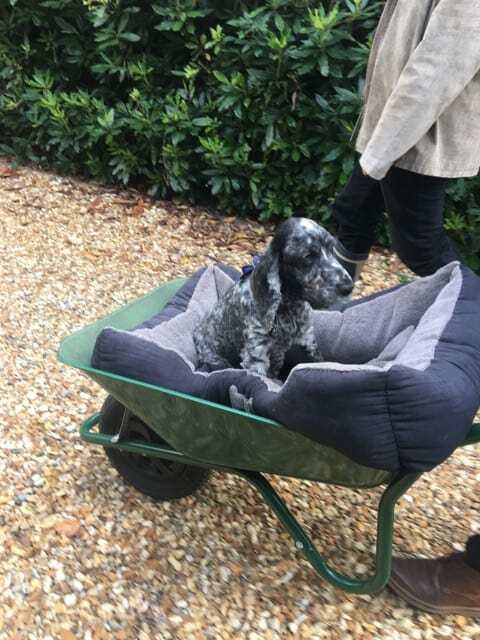 The picture shows my little pooch, Storm, who went on one of her last outings in our wheelbarrow a few weeks ago because she’d become too weak to walk. Grief is never simple, and our therapists believe that everyone grieves in their own personal way. I’ve been completely scatty since we buried Storm yesterday, you may find the slightest things sets you off blubbing. You may be sleeping for England, or find it impossible to get a good night’s kip. But however you’re reacting, homeopathy can be of enormous benefit to enable you to cope and get through. Grief develops, it is not a static single emotion. According to the ‘model’ created by the psychiatrist Elisabeth Kübler-Ross in her 1969 book On Death and Dying, there are five stages of grief: denial, anger, bargaining, depression and acceptance. But for many of us our pattern of grief is not linear like this, it does not progress in stages. Some people leapfrog over some of the stages, some go back and forth from one to another, some drag their heels to acceptance. Kübler-Ross’s model was originally created after she researched how patients go through coming to terms with a terminal illness – and it only later came to be applied generically to anyone who was grieving. So don’t think you have to do it ‘by the book’. As a homeopath, I acknowledge that grief is not so simple. We all grieve in our own personal way, and I’m here to help you with YOUR grief and your process of grieving. Whatever your situation – lost a dog, bereft over a broken relationship or redundancy, grieving a relative or lover, in shock over a terminal diagnosis, locked in silent anger over a loss – homeopaths have numerous remedies to ease the process. There is no single remedy ‘for’ grief. I would choose a remedy (or set of remedies) out of scores of possibilities, to help you each step of the way, whatever that way is. Arnica – in high potencies (not the levels you can buy over the counter, you need a strong dose, available from a registered homeopath). This is a remedy for shock. At the scene of a car accident, for example, everyone there would benefit from arnica – those in the accident, the police, ambulance staff, onlookers alike. You have almost definitely seen someone in this state: they are ‘fine’, they are coping remarkably well, busying themselves with the arrangements for the funeral, not weepy or dejected, operating on autopilot. Ignatia – the top homeopathic remedy for grief. A boon for someone in the full throws of grief, weepy, sighing, finding it hard to be consoled, having difficulty sleeping. This person will not be coping well with the funeral arrangements, and will be fragile, sensitive and a bit erratic in their behaviour. Oak – to help someone through any difficult period in life, oak gives strength and resilience. It is particularly good in any situation where someone is experiencing conflict or opposition: grim-faced determination in the face of adversity. Natrum mur – silent grief. The person has buried their feelings because it’s just the only way they can bear it. This is a particularly good remedy if someone is mourning a lost relationship, and is hurt and feeling rejected. They have put up walls against that hurt, find it hard to trust in new relationships, and there may be anger in there too. Aurum – disappointment, grieving something that used to be. This is a really good remedy when someone is floored by redundancy or a business disappointment. The grief can go deep as they feel they are a complete failure and have lost purpose and status in life. Sandalwood – a new remedy, only recently introduced to the homeopathic repertoire, sandalwood is especially beneficial for anyone who is still locked in grief after a long time. They have never quite got over their loss. The textbook says it is ‘a balm to the spirit and the emotions’, and I have certainly found sandalwood can be a great comforter, enabling a person to think more positively, relax with their memories and let go. Is it safe to give echinacea to children?